In truth, we don't know. He is a rescue picked up as a stray so no prior history, no ducumentation. No pedigree. 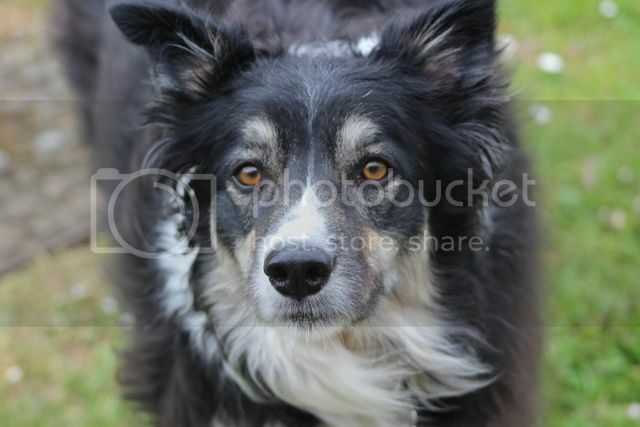 He does look the business and he has collie traits - the herding instinct, that stare, the concentration, patience, biddable.....some of the things one would associate with collies. He may not be pure collie but, if not, there's an awful lot of collie in him. I've mentioned that I grew up on a farm in Scotland where we had about 3,000 sheep and usually four collies. Different characters but the similar, typical behaviour. I think Max has the most beautiful face. Ice, Tyto's brother is at an agility show this weekend and is winning and getting placed well. Not bad for a dog of 11.5 years. Thank you kindly. I'll tell him! He has a lovely nature and makes people smile. Especially children. And yes, excellent for a dog of 11.5 years. Well as I can't put photos on here are a few of my beautiful boy who was 12 today and is still just as handsome as ever and playful. Please go to the first page. Happy Birthday Tyto. Enjoy your special day. I and others have had problems with photobucket which I used for years. I now use imgur. Maybe that would work for you. Well it would have been Tyto's 13th birthday today. I still miss him very much. His litter brother Ice sent me a lovely pic of himself with his new birthday toy. Happy Birthday Ice. x I am so greatful to Helen for sending me it and keeping in touch.